We have managed to attracted a diversity of birds and pollinators to our garden, but I've only seen one or two lizards in the past year. 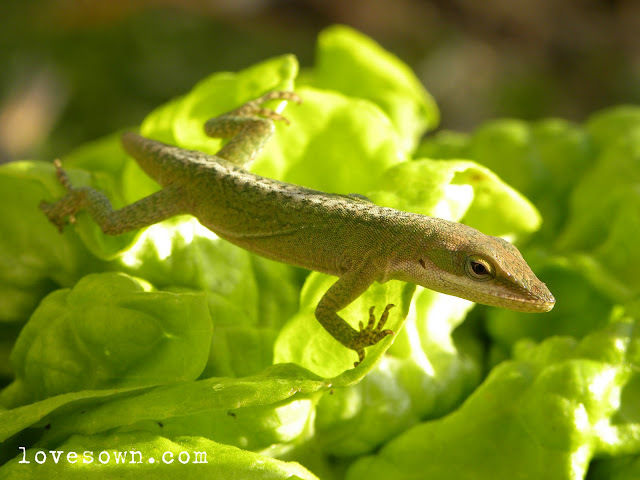 There are several benefits to having lizards in your home garden. They are one more critter for kids to learn about! To create a lizard habitat, I first selected an area of the garden where there wasn't a lot of foot traffic and there was plenty of vegetative cover. My son, Scooby, also gave me some input and liked that it was right next to his "rock quarry". 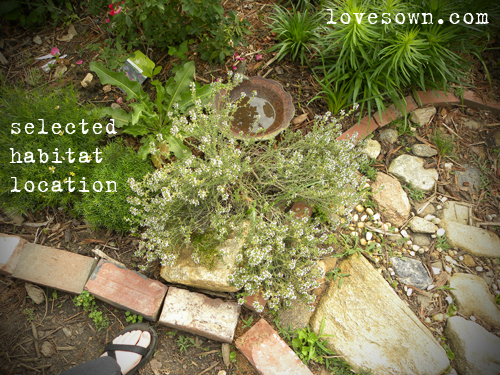 In the pollinator section, there are plenty of flowers and a perennial thyme as well as an area with rocks and bricks. This would ensure an area for sunning, but protection from predators. 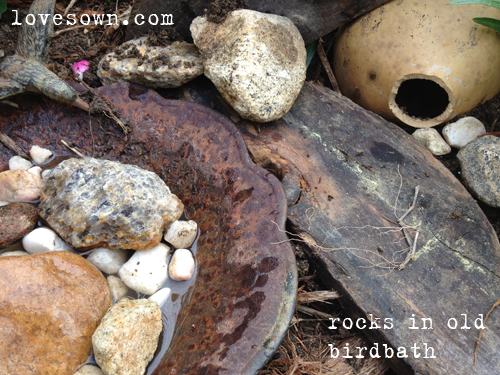 We also have a broken birdbath that was already in the location. 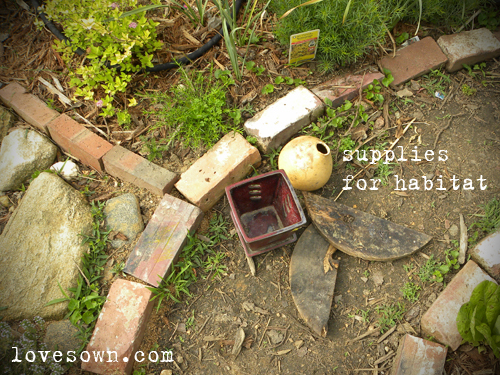 I gathered some materials I had on hand: a birdhouse gourd, some flat pieces of wood from a broken barrel planter, and an orchid pot I found for $1 on a clearance rack. I sank the birdhouse gourd into the soil just a little to secure it and did the same with one of the flat pieces of wood.I placed the other board at the entrance of the gourd between it and birdbath. 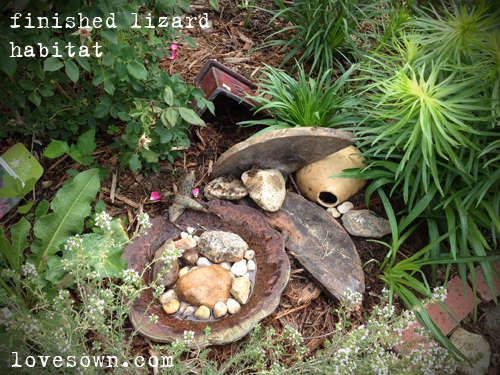 I added rocks and pebbles to the birdbath lest I cause any accidental lizard drownings. This will also benefit bees and butterflies who don't do so well landing on the water surface to drink. This is the finished habitat. 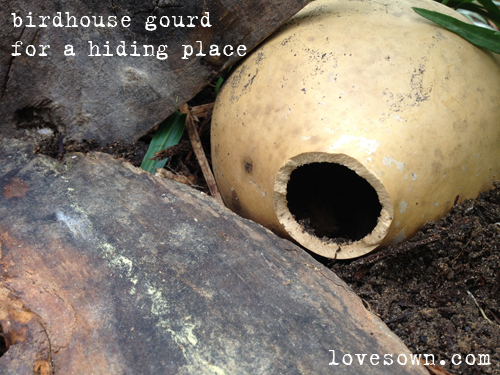 There are several hiding places, a variety of texture, and tunnels through which to crawl. Danielle, you know I wrote this at your request ;) Have fun! It never even crossed my mind to create a lizard habitat. Right now I have seen several lizards around. Even so, it could be a great activity to do with the kids. Constructive rather than destructive!